Ritendra Roy (born 11th March, 1972, New York, U.S.A) received his training in fine art from two heritage institutions based in West Bengal. 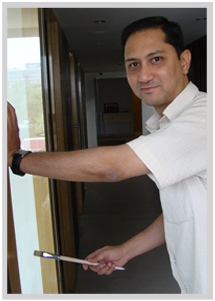 He earned his Bachelor's from Rabindra Bharati University, Kolkata in 1997, and subsequently his Master's from Visva Bharati, Santiniketan in 1999. After having a meritorious career as a top-grade student of Painting he then caught the attention of the discerning observers of the art scene through his numerous expositions as a professional. His imaginative faculty and technical virtuosity have brought him recognition through notable Awards and Scholarships from the Government and different Institutions. Along with his practical experiments he has demonstrated considerable interest in research activities and teaching assignments and has presented papers and contributed articles on art and cultural studies. At present he is also attached as an Associate Professor in the Department of Visual Arts, University of Kalyani, West Bengal. His works are now in various collections and continue to evoke much interest among art lovers and connoisseurs. He is a resident of Kolkata, a city recognized as the cultural centre of India. The origination of a concept is sourced from various associations within the huge space of the inhabited landscape. The different elements that constitute paradigms of 'interior' and 'exterior' landscape create an order of mental picture which helps to embody a 'new' form through a practice of systematic analysis and reduction of criteria. The process gives me an opportunity to go beyond the order of things where I may encounter a shared form of communication with the onlooker. The multiplicity of interpretations of the communion tends to create various possibilities of 'readings'. The spatial patterning of these readings has a great deal to do with the nature of social encounter, the kind of which determines my built-in space. The simultaneous experience of two modes of envelopment and detachment which contribute a sense of enjoyment of being has helped in my realm of perception. The spatial relationships that I experience with respect to the components of colour, texture, space with its light and quietness combined with an innate and sublime geometry, all synthesize to compose a feeling of rhythmic balance. The almost palpable atmospheric space within the environ of urban architecture and the possibility of movement within a constricted area creates a thought-provoking atmosphere. The distinct colour shifts and the intensity of emotion of a ‘colour-field’ generate a profound effect on my psyche. Occasionally the integrated components of light and dark metamorphose as private spaces for introspection devoid of the image of human figure, but the presence being contemplated. The arrangement, context, counterpoint and technique become important for the objective transformation of my work, helping for the creation of a subjective dialogue. For pictorial structuring both symmetry and non-symmetry of geometricity along with various gravities of flat, opaque, transparent or textured colour have been explored to achieve an organized whole. The analysis and control which I exercise over the making-process, and its role and importance as a carrier of the image has helped to enrich my practice. All these have enabled me to acknowledge my search for a perfect visual equilibrium.